Including Ring Pillow, Flower Girl Basket, Guest Book, Pen Set and Garter. 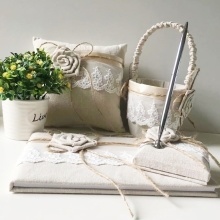 Made of natural burlap and lace, elegant and shabby chic, perfect for wedding. Guest book contains 36 pages for guests to sign and write down their thoughts. Light basket is great for being put few flowers in wedding ceremony party. Ring Pillow Size: 15*15*5cm / 6*6*2in. Flower Basket Size: 22.5*13*12cm (H*L*W) / 8.8*5.1*4.7in. Package Size: 24*22*20cm / 9.45*8.66*7.87in. Package Weight: 670g / 23.63oz.